At this point, pretty much everything has been turned into a knife. There are the obvious found objects that can be turned into knives, such as old files and railroad spikes. In fact, you can watch these items along with 10 others be turned into 12 different knives in an old post. Then, Kiwami Japan came along and upped the ante by turning unimaginable items into knives, such as gelatin, stone, and even underwear! Another of our favorite YouTubers is back with some interesting experiments. This time knifemaker Steve Calvert aka Green Beetle attempted to make a knife from nickel wound guitar strings. The best YouTubers out there are the ones with the best imagination along with the skills to bring their ideas to life. Colin Furze is the best at this when it comes to insane creations (with Joerg Sprave not far behind). 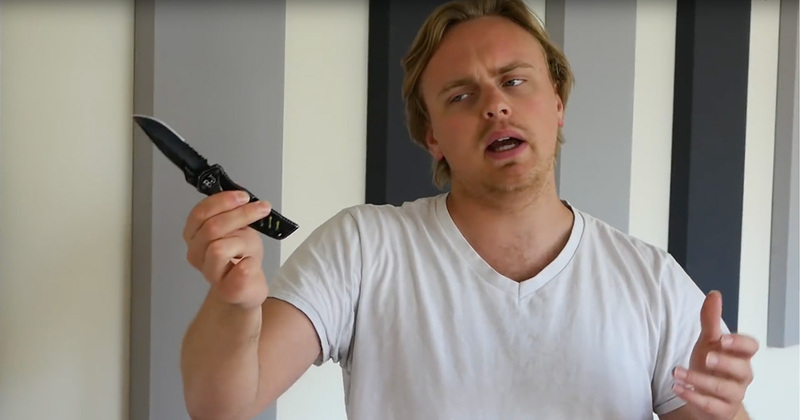 In Colin’s most recent video, the backyard scientist and general madman decided to once again venture into the world of knives with an idea to create a belt of spinning knives to quickly make a salad. 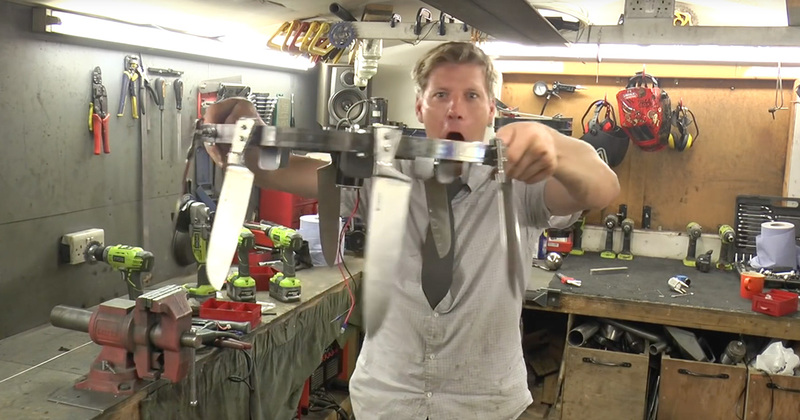 Colin has made some other interesting knife-related projects like homemade Wolverine claws, but his spinning belt of doom is way more dangerous. He attached eight kitchen knives on hinges to a belt that can spin at 1000RPM all in the pursuit of cutting a salad. You can see he actually gets hurt pretty bad at the end of the video when the belt goes a little haywire (see the growing blood spot on his shirt and the big scratch on his arm). If you’re like me, you always look for an opportunity to take out your knife to help when some other tool like scissors could work just as well. That’s why this hilarious video from YouTuber Gus Johnson hit so close to home. While I’d like to think I’m not this extreme (and I would never ever storm over a couch with an open knife in my hand), my wife and kids would probably say otherwise. This seems to be the first knife-related post from Johnson and company but the fact that it’s so accurate on so many levels makes me think that Johnson or at least someone from his inner circle is a knife person. Do I post far too many videos from YouTuber kiwami japan? Probably. Am I going to stop? Probably not. Kiwami japan is one of the most ingenious YouTubers out there, making knives from all types of bizarre materials. He doesn’t use regular materials like steel. Instead, he uses everything from Jell-O to aluminum foil. In one of his most recent videos, he turns underwear into a knife. Yes, underwear. Upcycling is the act of reusing unwanted products or waste to make something new and intriguing. Steve Miller of Miller Knives has made a YouTube career out of transforming found objects into interesting knives. I honestly think one of his most recent videos features his best creation yet. Miller acquired an old rabbit trap that was not only rusted beyond repair but illegal to use in Australia. So, he decided to turn it into a knife. One of my favorite genres of YouTube videos is watching people make knives out of unusual things. No one is better at this genre than a YouTuber known as kiwami japan. 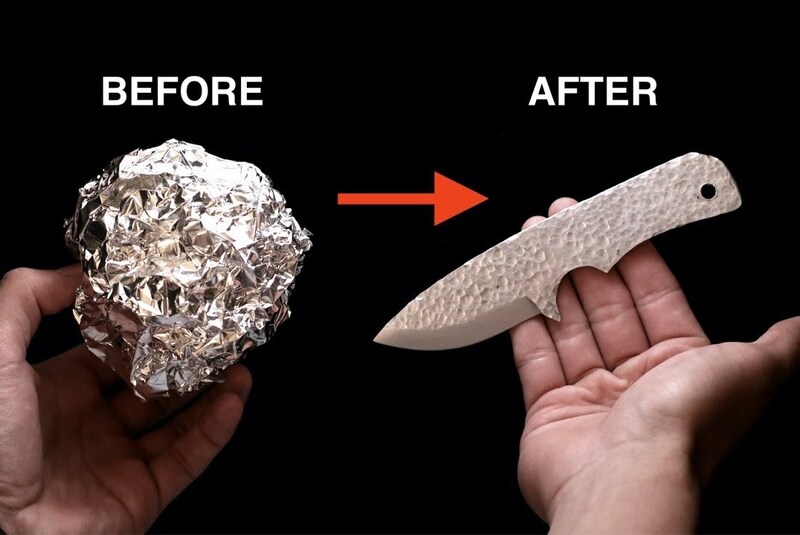 I mentioned his work in a blog post about two months ago relating to knives made from rolls of aluminum foil, but one of his more recent videos takes the cake. 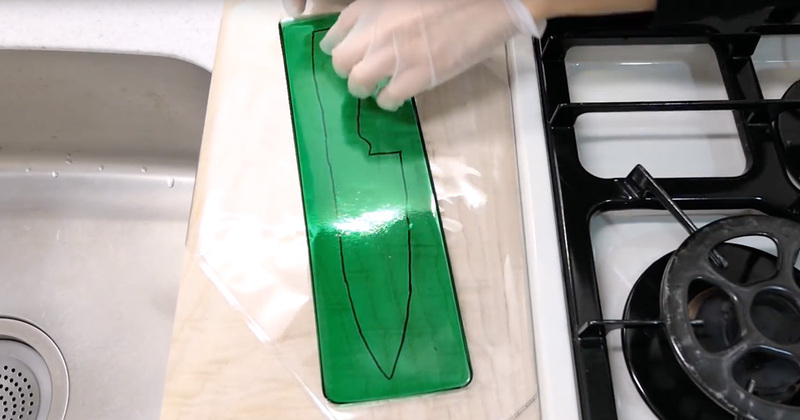 The Japanese knifemaker makes a functional and razor-sharp knife out of gelatin. That’s right, that soft liquidy substance made from extract from boiled skin, bones, and connective tissues of animals was turned into a knife. Aluminum is one of the most commonly used metals. In fact, it is one of the most abundant elements on earth. So why is it that people never mention aluminum when making knife blades? Well, despite being lightweight and durable, aluminum is extremely soft. That means a knife made from aluminum would dull quicker than you could sharpen it. But that hasn’t stopped some enterprising knifemakers from experimenting with aluminum blades. In March, one of the most creative knifemakers in Japan made a fantastic kitchen knife out of a roll of aluminum foil. Aside from that Japanese knifemaker, few are more skilled or creative at the videos turning everyday objects into knives than Steve Miller from Miller Knives. I’ve highlighted his videos in the past — such as the time he turned a rusty wrench into a knife or the time he made a folder out of a bullet — but he too took on the challenge of making a knife from aluminum foil. KA-BAR the company is celebrating its 120th anniversary on April 29th. In honor of its amazing longevity, KA-BAR dove deep into the history of the brand — from inception in the late 1800s all the way to today. 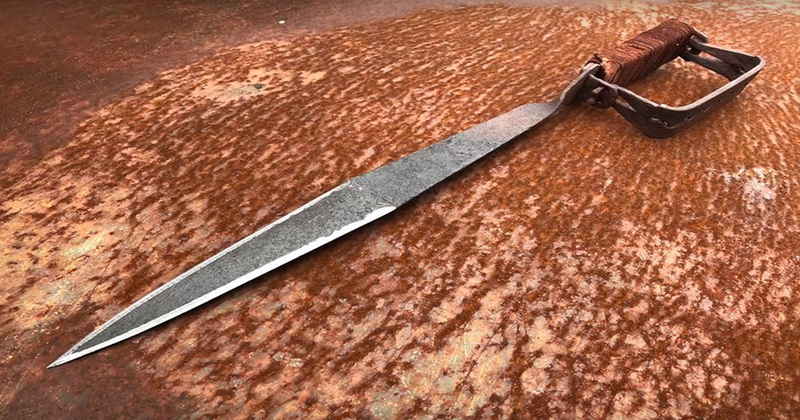 This deep dive culminated in a four-part documentary series released over the past few weeks on the KA-BAR YouTube channel. These four videos are exceptionally well-made and track the company through the decades as it responds to major events in U.S. history. 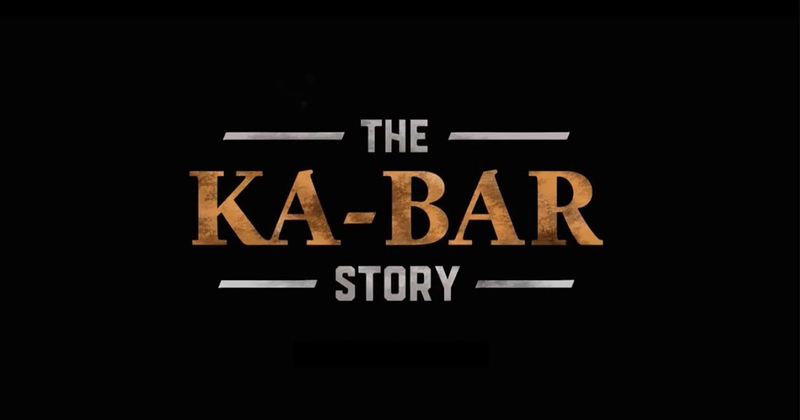 KA-BAR got some actors to play historical figures in the company that really help you visualize the company. I wrote my own brief history of the KA-BAR brand and a closer look into what makes the company so great a few years back. But even I learned a few new things about the brand from the video. For example, I’m glad the company didn’t keep the name Tidioute Cutlery. I would have liked this documentary better had it been released as one video (since you get a minute intro at the beginning and about four minutes of credits at the end of each video). If you were to ask most knife people what Cold Steel is best known for, they’d probably say those insane videos showing president Lynn C. Thompson and others cutting pieces of thick rope or chunks of meat with heavy metal playing in the background. While Cold Steel has gone through quite a transformation over the years, bringing some of the strongest folding knives to the market and constantly trying to improve in every way, it will always be known for its over-the-top marketing. According to legend, they started making the videos more than 30 years ago to prove just how strong their knives were. Cold Steel claims the videos “stunned the industry” with their graphic testing. Sharpening is a necessary evil when you own knives. While it can be complicated to start with, it doesn’t need to be with a little practice. 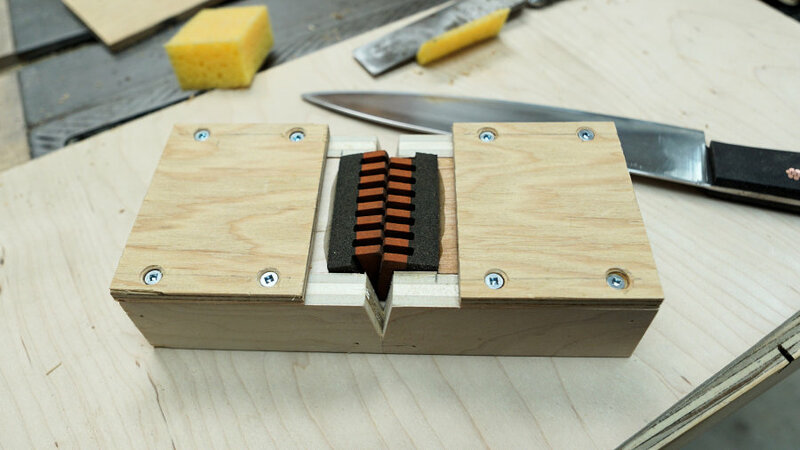 But, if you’re good with your hands, you can make your life easier by making your own knife sharpener with a few simple items. That’s what carpenter John Heisz of I Build It did on his YouTube channel. By using an old oil stone and some plywood, he was able to craft a homemade knife sharpener that you pull through interlocking teeth.